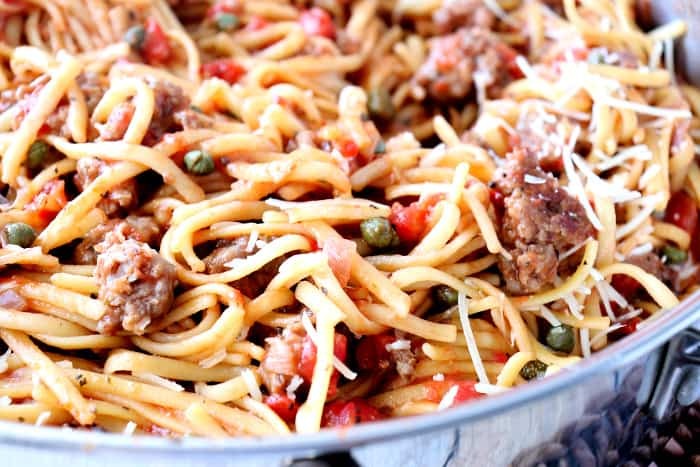 One Pot Pasta of Linguine, Italian Sausage, Tomatoes, and Capers is an easy and satisfying meal for busy nights when time is tight, the family is hungry, and you don’t want to fuss with too much prep or cleanup. In under 30 minutes, you can have this one-pot pasta wonder on the table with basic pantry ingredients. When everything cooks together in one pot and is ready to serve in under 30 minutes, this amazingly delicious and straightforward linguine dinner with tomatoes and capers will come in handy to have in your dinner repertoire time and time again. The ingredients in this easy Italian pasta dinner are pantry staples so you’ll always be ready to serve this one-pot wonder at a moments notice! Yay for easy, fuss-free dinners! 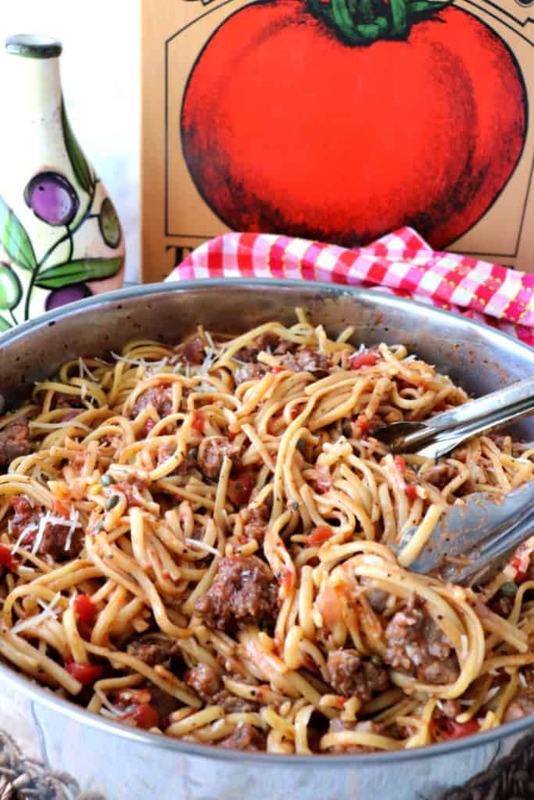 **Please Note – The printable recipe card with detailed instructions, complete ingredient measurements, and nutritional information for making One Pot Linguine with Italian Sausage, Tomatoes, and Capers is available near the end of this post. What are the benefits of cooking a one-pot pasta meal? 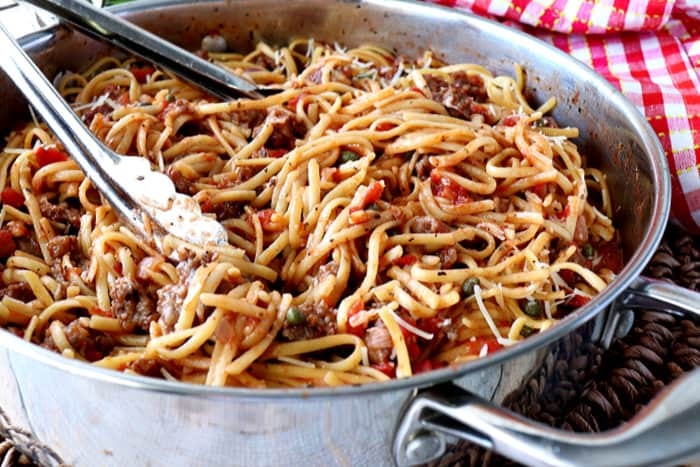 The pasta slurps up all of the flavors inside the pot, making it much more flavorful and delicious. How do I know how much liquid to use when cooking a one-pot pasta meal? Great question! As a rule of thumb, I like to add enough water to cover the pasta fairly generously. That doesn’t mean drown the uncooked pasta in liquid, but it doesn’t mean be stingy with it either. Remember that, as it cooks, the pasta will swell up slightly so you want to have enough liquid in the pot to allow the pasta to cook Al dente, but not have too much additional liquid in the pot so that the pasta is swimming when it’s time to serve. Cooked but still slightly firm when bitten. Do I have to use linguine in this dish or can I use another form of dried pasta? Feel free to use whatever dried pasta you have on hand, or that is your favorite. Just remember that the actual cooking time may need to be adjusted (either longer or shorter) depending on the pasta you’re using. A thicker, heartier pasta (like rigatoni) will take slightly longer than a thinner, smaller pasta (like orzo). The liquid may also need to be adjusted depending on the pasta you’re using, so make sure to refer back to the above section when deciding how much liquid should be used when cooking a one-pot pasta dish. This one-pot Italian pasta is sure to please the entire family. What if I want to make this a vegetarian dish? Can I do that? Leave out the meat altogether, and instead of using a beef broth or stock, you can use vegetable stock or broth, additional water, or even wine. Just make sure you add enough liquid to sufficiently cover the pasta as it cooks. Can I add fresh spinach or kale to this dish and when would I do so? That’s a FANTASTIC idea! Yes! Do it! Add the fresh spinach or fresh chopped kale to the pot in the last 2-3 minutes of cooking time. The heat from the pasta will wilt the spinach or kale nicely and add more vitamins and nutrients to your meal. What are capers and do I need to add them? Capers are the small, edible, unopened flower buds from a plant known as Capparis Spinosa (aka caper plant). Capers are normally picked or salted. 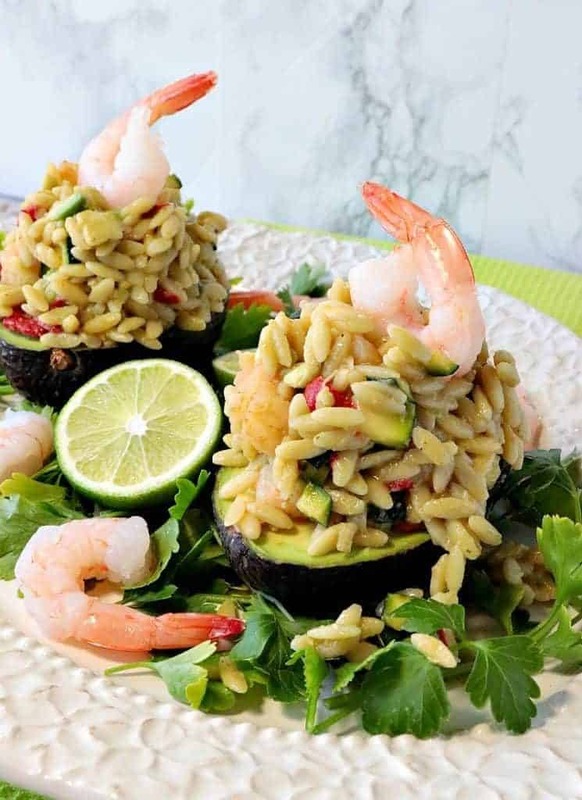 When added to dishes capers lend a tangy bite which compliments and lightens flavors which otherwise could be considered heavy or unctuous. You can certainly omit the capers in this recipe if you’d like, but I encourage you to add them for that extra added kick which will really make this dish pop with flavor! Where do I find capers in the market? Capers can be found in the pickle and vinegar section of the market, and in most stores, they’ll also be found in the International section. Capers add a tangy touch to this one-pot pasta dish that makes it pop with flavor! In a large, high sided skillet brown the Italian sausage over medium/high heat in olive oil. Add one chopped onion and cook until the onion is slightly translucent. Stir in the garlic, dried oregano, dried basil, salt, pepper. Add the large can of diced tomatoes along with their juice. Stir in the beef stock (or broth), and the water. Add the pasta and gently push it under the liquid until it’s submerged. *Note – If more liquid is needed to add enough so the pasta is submerged, but not overly so. Add 1 teaspoon of salt to season the pasta, and stir well. Cover the pot, reduce the heat to medium/low and simmer for approximately 5 – 6 minutes. Remove the lid and stir well. Cook for an additional 1 – 3 minutes, uncovered until the pasta is Al Dante. Add the capers and stir. Serve hot, and top with Parmesan cheese, if desired. 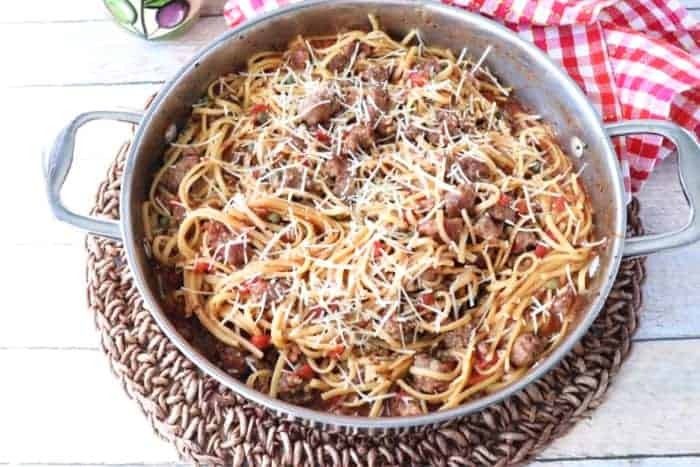 **The following affiliate links are some suggested products I’ve chosen that will aid you in the making and serving of this recipe for One Pot Linguine with Italian Sausage, Tomatoes and Capers if desired. Below is the printable recipe card for today’s One Pot Pasta of Linguine with Italian Sausage, Tomatoes, and Capers. 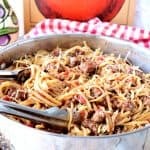 One Pot Pasta dinner of Linguine, Italian Sausage, Tomatoes, and Capers is an easy and satisfying meal for busy nights when time is tight, the family is hungry, and you don't want to fuss with too much prep or cleanup. Add one chopped onion and cook until the onion is slightly translucent. Approximately 2-3 minutes. Add the pasta and gently push it under the liquid until it's submerged. *Note - If more liquid is needed, add more water so the pasta is submerged but not overly so. Partially cover the pot (leaving the spoon in the pot to prevent a boil-over), reduce the heat to medium/low, and simmer for approximately 5 - 6 minutes. Cook for an additional 1 - 3 minutes, uncovered until the pasta is al Dante. To finish, add the drained capers and stir. How long will the leftovers keep in the refrigerator? 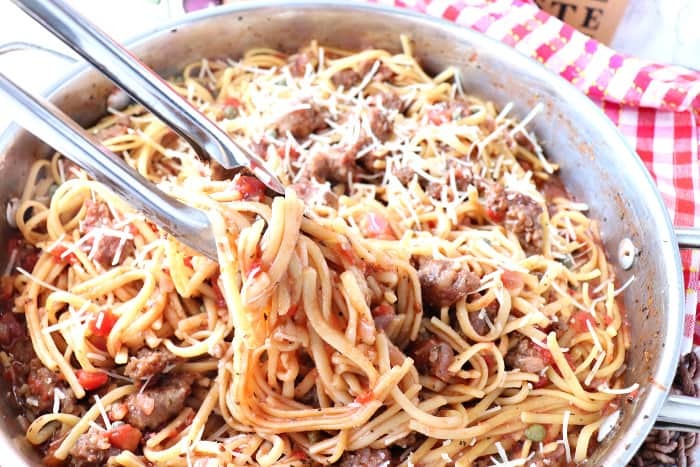 If you’re lucky enough to have leftovers (and isn’t Italian even more flavorful the next day? ), when stored in an air-tight container this will last in the fridge for up to 5 days. This One-Pot Linguine with Sausage, Tomatoes, and Capers also freezes well and can be made in advance if needed. Dig in! Your dinner is served! 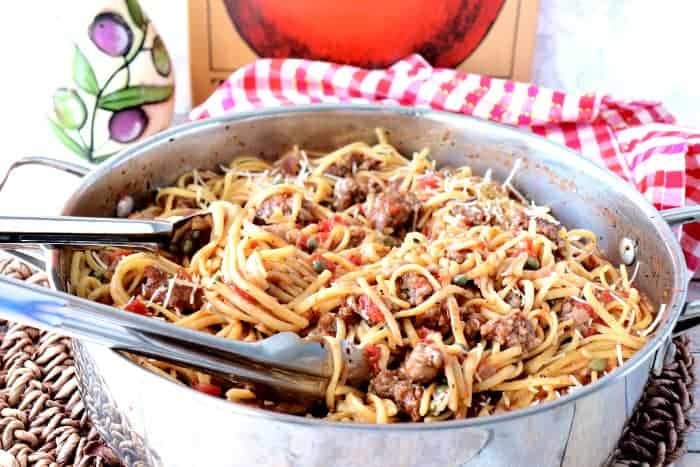 I sincerely hope you’ve enjoyed today’s recipe for this one-pot wonder of linguine with Italian sausage, tomatoes, and capers as much as I’ve enjoyed bringing it to you! **Note – The post above includes affiliate links. When I find a great product or service, I like to share it with my readers. Sometimes I use affiliate links so I can earn a commission for my recommendations. As always, thank you so much for your support! This is a great one pot meal! Thanks for the recipe. I love using hot Italian sausage here. 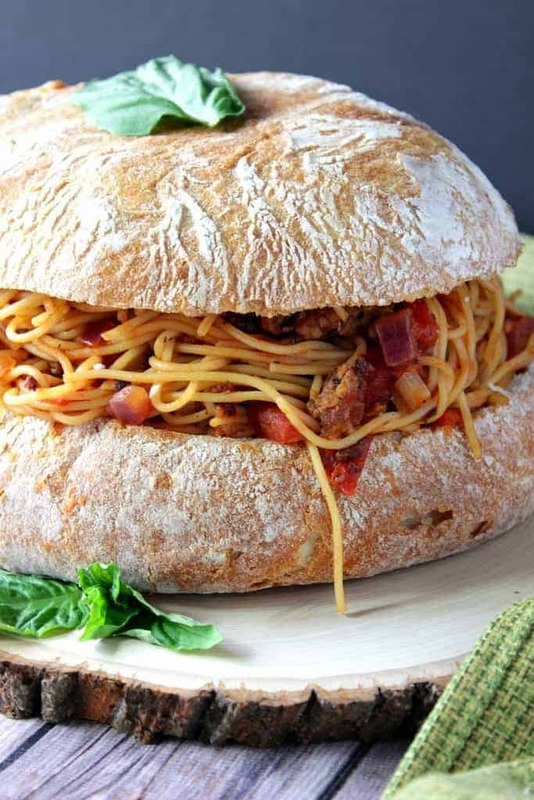 Gives it a bite that we love!